The North Myrtle Beach rentals at Beachwalk Villas have either two or three bedrooms. The two-bedroom, two-bath North Myrtle Beach condominiums at Beachwalk Villas sleep from six to 10 people. The three-bedroom, three-bath North Myrtle Beach vacation rentals accommodate eight to 12 people. Most of these condos in North Myrtle Beach, SC are on the oceanfront with an oceanfront balcony. Some of these North Myrtle Beach condominiums have side views of the Atlantic Ocean from their ocean view balconies. These side view condominiums also boast a glorious view of the salt marsh from their balcony so you can see the sunrise on the ocean and the sunset over the marsh. These North Myrtle Beach rentals are nicely decorated and feature a wide range of amenities. One of the first things you will notice about these condos in North Myrtle Beach, SC is the well equipped kitchen. Full-size appliances in the kitchen of these North Myrtle Beach condo rentals include a dishwasher. A microwave adds to the conveniences that are at your fingertips during your North Myrtle Beach vacation and a coffee maker means you can brew a fresh pot of coffee early in the morning and enjoy it on the ocean view balcony. Each of the North Myrtle Beach condo rentals has a washing machine and clothes dryer and some of these units at Beachwalk Villas feature a Jacuzzi tub. Sun streams into the living room of these North Myrtle Beach condominiums through the sliding glass doors that access the ocean view balconies. The master suites at Beachwalk Villas open to the balcony as well so you can even sleep with your balcony door open slightly so you can hear the waves all night long. 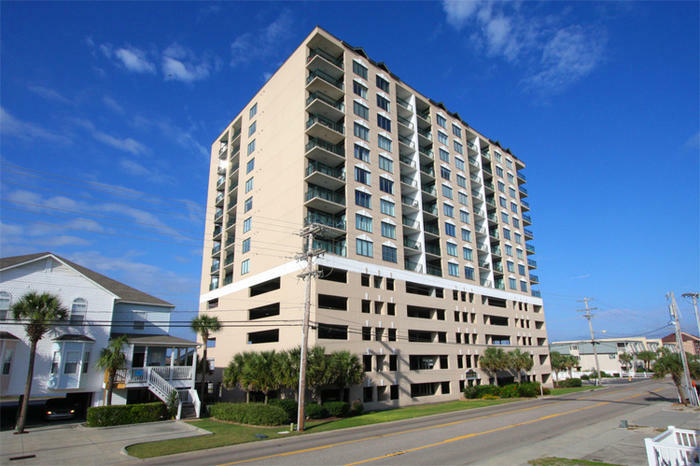 Creature comforts of home are found in these condos in North Myrtle Beach, SC, such as televisions and a DVD player and some of the units have high-speed Internet access. With all of these features your family can escape completely during your North Myrtle Beach vacation at Beachwalk Villas. Sit a spell on the balcony with your favorite book or play a game with the kids while you watch the beach come alive with families. Go down to the oceanfront pool and take a refreshing dip every day of your North Myrtle Beach vacation. The pool is outside and while you are there you can hear the waves crashing ashore and the sound of seagulls as they fly high over the Atlantic Ocean. Put a beach towel, sunglasses and sunscreen in a beach tote and head to the waterfront. Build sand castles, take long walks, swim in the surf and comb the beach for seashells. When you get hungry or need a cold drink you are just across the street from your comfortable North Myrtle Beach condominium at Beachwalk Villas. Enhance your beach vacation at this North Myrtle Beach resort by exploring all that the Myrtle Beach area has to offer. Taste the delicious cuisine that makes this seaside town popular: shrimp, crabs, clams, fish and oysters. Pick one of the family-friendly shows at a nearby live entertainment theatre and get front row seats to a musical production that is sprinkled with comedy. The Carolina Opry, Pirates Voyage, Alabama Theatre and Medieval Times are all in close proximity to Beachwalk Villas. Does anyone in your family like the game of golf? The Myrtle Beach area has more than 100 golf courses in the area so be sure to bring your golf clubs when you vacation at Beachwalk Villas. Make a tee time and hit the links for a challenging golf game. Water sports in the Myrtle Beach area include parasailing, Sea Doo rentals, and banana boat rides. Dolphin watch tours, speed boat cruises, sailing charters, river tours and canoe and kayak rentals are all ways your family can have fun on the water during your North Myrtle Beach vacation. Elliott Beach Rentals is not affiliated with onsite management or the HOA of Beachwalk Villas.